Ancient city of Old Kandahar (red) on the western side of Kandahar. An 1881 photo showing the ruined Old Kandahar citadel of Shah Hussain Hotakthat was destroyed by the Afsharid forces of Nader Shah Afshar in 1738. This destroyed fortress is still standing today. 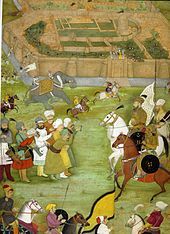 A miniature from Padshahnama depicting the surrender of the Safavids in 1638 to the Mughal army of Shah Jahan commanded by Kilij Khan. Old Kandahar (locally known as Zorr Shaar; Pashto: ??? ??? ?, meaning "Old City") is a historical section of the city of Kandahar in southern Afghanistan. It is thought its foundation was laid out by Alexander the Great in 330 BC under the name Alexandria Arachosia. and served as the local seat of power for many rulers in the last 2,000 years. It became part of many empires, including the Mauryans (322 BC-185 BC), Indo-Scythians (200 BC-400 AD), Sassanids, Arabs, Zunbils, Saffarids, Ghaznavids, Ghorids, Timurids, Mughals, Safavids, and others. It was one of the main cities of Arachosia, a historical region sitting between Greater Iran and the Indus Valley Civilization. The city has been a frequent target for conquest because of its strategic location in Southern Asia, controlling the main trade route linking the Indian subcontinent with the Middle East, Central Asia and the Persian Gulf. The city was often fought over by the Safavids and the Mughals until 1709, when Mirwais Hotak made the region an independent kingdom and turned Kandahar into the capital of the Hotak dynasty. The city was destroyed by Nader Shah Afshar and his Afsharid forces in 1738 after defeating Shah Hussain Hotak, the last Hotak ruler. After the destruction of this old city all the remaining inhabitants were relocated to a nearby area which became known as "Naderabad" for a short time, named after Nader Shah Afshar. By 1750, Ahmad Shah Durrani had laid out the current city of Kandahar and turned it into the capital of his Durrani Empire. Plan of ancient fortifications of Kandahar.